The XtraFluff Orange Microfiber Wash Mitt combines two different microfiber blends for a unique microfiber wash mitt that will remove debris and contaminants from your paint without damage! With an interior seam, the XtraFluff Orange Microfiber Wash Mitt fits two fingers on each side and promotes a strong grip. The white cuff fits snugly on your wrist and lets you wash your car without hassle! You’ve tried most of the microfiber wash mitts out there – but you haven’t tried anything like the XtraFluff Orange Microfiber Wash Mitt yet! The tools you use to create that perfect finish are just as important as the products you use. If you have high-quality car wash shampoo, but a low-grade wash mitt, it doesn’t matter how safely you wash the paint, you’re chances of washing-induced swirls has gone up! The XtraFluff Orange Microfiber Wash Mitt features individual strands of microfiber, threaded through “clumps” of super-soft, paint safe fabric – both of which promote a clean surface! Use the XtraFluff Orange Microfiber Wash mitt with a high foaming shampoo for an ultra-safe car wash! The long strands of the XtraFluff Orange Microfiber Wash Mitt grab onto surface debris and contaminants and gently pull them away from the surface. Once off the surface of your paint, the paint marring particles are held in the long fibers until safely removed in your rinse bucket. Regardless of what you’re removing from your paint, be they bugs or mud, the XtraFluff Orange Microfiber Wash Mitt gets them off no problem! 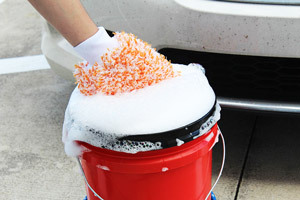 When used with a high-sudsing shampoo, like the Blackfire Wet Diamond Conditioning Shampoo, the XtraFluff Orange Microfiber Wash mitt glides effortlessly across your paint for a safe and effective car wash.
Great product. Glides over my car. Lighter than other wash mitts. Cleans up great. The XtraFluff wash mitt is superior to all of the other microfiber wash mitts because it glides over my car surface rather than dragging on the surface like standard wash mitts. The XtraFluff mitt probably holds less water than other standard mitts but there is no dead space between loops. I generally use two of the XtraFluff mitts to wash my car and it's worth it to me to feel the "gliding action" of both mitt's. Standard wash mitts have a considerable "dead space" in between the larger loops, wheres the XtraFluff mitt has no dead space between its more numerous smaller loops. This was the first time I purchased this product. I this it is well made. The mit fits my hand well stays on when using. I would recommend this mit to others as a car maintenance item to have in their inventory.